Wait, what? A forest fire may not sound like a great way to cool off, but Earth's climate is a complicated beast. It turns out that some of the world's fiercest blazes are actually lowering our planet's temperatures. The remote boreal forests that blanket massive swaths of Canada and Alaska aren't just lush and gorgeous. They are also part of the vast carbon cycling system that regulates temperature all over the globe. These forests absorb vast quantities of carbon—by some estimates, nearly forty percent of Earth's terrestrial inventory—in their vegetation and soils. And that's a very good thing, because all that carbon might otherwise end up in our atmosphere, adding to our global warming woes. But there's another reason these kinds of forests matter to Earth's climate: They are optimized for burning. Strangely enough, this has to do with the frigid climate. In a Narnia-like land where temperatures can be well below freezing for up to seven months of the year, it takes longer for vegetation to decompose. Thick piles of organic matter accumulate on forest floors. These heaps of kindle can, at the drop of a match or a lightning strike, cause an entire forest to ignite in just hours. Indeed, some forests are prone to vicious fires that rage for weeks on end, leaving thousands of hectares of destruction in their wake. In a paper which appears in Nature Geoscience this month, a group of ecologists demonstrated that these fires scorching Earth's northernmost forests can, paradoxically, have a chilling effect on our climate. A smoldering blaze kicks up plumes of heat-trapping soot, which eventually settle back to the ground, hastening snowmelt. Combustion also releases carbon dioxide, our planet's most important heat-trapping greenhouse gas. These effects, like the heat from the blaze itself, tend to warm the planet up. But as wildfires eat through forests, they also expose the ground, and in the far north, that means uncovering snow and ice. The dark, leafy landscape becomes a bright, reflective one. In climate science lingo, reflectivity is called albedo, and it's a critically important factor for determining how much of the sun's energy our planet absorbs. By increasing a landscape's albedo, fires can reflect more of the sun's radiation back to space and cool the climate. Trees, in other words, affect our climate almost as much as humans do. "Given the scale of boreal forests, this study may document the single largest influence of individual species on global carbon and energy flow, except for humans," lead study author Brendan Rogers of the Woods Hole Research Center told me. "This is critical for Earth system modeling and projecting future climate feedbacks in high latitude environments." So, fires can cause temperatures to teeter up and down. And when it comes to boreal lands, it's not at all clear which direction we should expect the thermometer swing. If scientists knew that, they'd be better poised to predict how human interventions—things like fire suppression and deforestation—impact Earth's climate. To figure out how boreal blazes affect our planet's thermostat, the researchers decided to go big. They used satellite images to pinpoint massive conflagrations across boreal North America and Eurasia and track the fires' effects over time. Across the globe, a striking pattern soon emerged: Fires burned differently on the two continents. Searing hot, destructive blazes swept across North America, consuming trees and leaving battered toothpick vistas in their wake. Following these vicious burns, springtime albedo increased dramatically, creating a local cooling effect. In the Old World, fires were more subdued, spreading across forest floors but rarely reaching canopies or killing trees. As a result, the albedo of these forests didn't change dramatically, and the fires tended to be climate-neutral. The extreme variation in fire patterns across two continents can be explained by looking at the trees themselves. 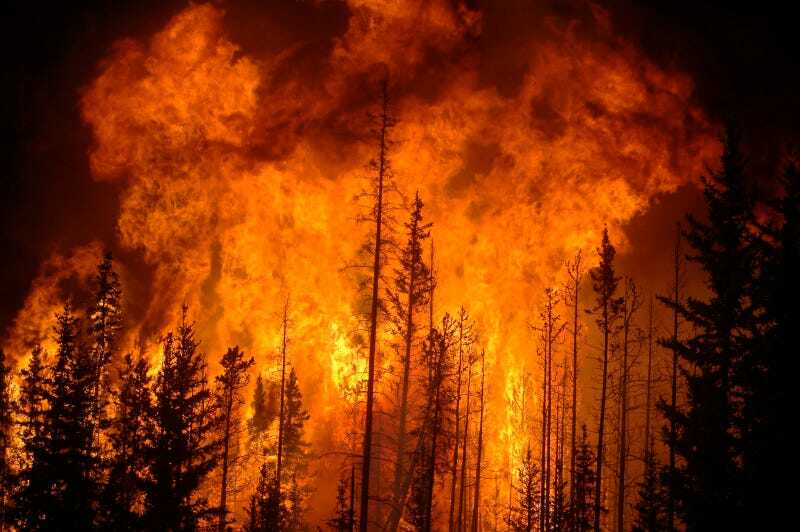 Boreal forests of North America are dominated by so-called "fire embracers"—species like black spruce and pine, whose seeds are fire-activated. As one generation of embracers is consumed by flames, a new one sprouts from the ashes. In Eurasia, more common are the "fire resisters," species that quell the spread of fire by dropping their lower branches as they grow and armoring themselves with thick coats of bark. "This is a prime example of how individual species can impact large scale phenomena," Rogers told me. Indeed, there are very few instances in nature of a single species influencing climate patterns on a continental scale. The best parallel we've got is ourselves. It remains a mystery how a handful of cold-hardy tree species came to drive fire and climate patterns across the world. "It's an extremely interesting question, why the trees in North America evolved to help promote and be consumed by fire, while those in Eurasia have evolved in the opposite direction," Rogers said. Researchers are currently investigating possible causes, including the higher incidences of lightning across Eurasia, which may select for species that are better at withstanding and suppressing fire. Insights from this work will also help scientists refine Earth system models needed to predict future climate change, and to make smarter forest management decisions today. "Because current global models do not account for these species-level traits, they misrepresent the effects of fires on ecosystems and the atmosphere," Rogers told me. "We also need to start using this type of information if we hope to manage fire-prone boreal forests for their climate mitigation potential." Maybe it's time to stop trying to suppress nature's fiercest blazes, and just let them burn. These days, we need all the help we can get managing our climate. Trees figured it out millions of years ago.